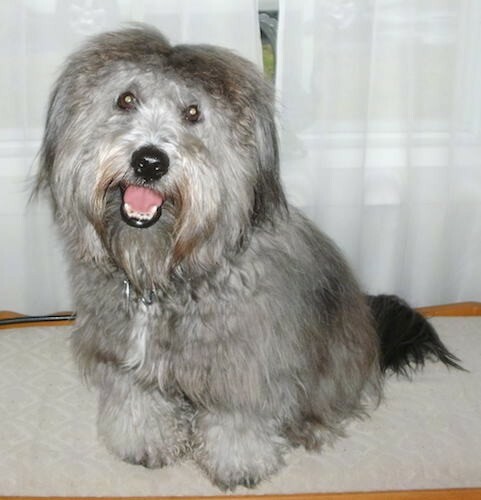 "Here is a photo of my Soft coated Wheaten Terrier / Bichon mix clown dog Barney at almost 3 years old. I call him a Whichon, although he is not registered as such, but his mom, Pebbles (Bichon), and his dad, Clay Clay (Wheaten) are registered in their breed. When I held this pup at eight weeks, it was love at first sight. He is the sweetest, smartest dog I have ever owned. He has never shown any agression toward anyone and only wants to play. He loves children and they all want to pet him because his coat is so soft and fluffy. I swear sometimes when he looks up at me he knows exactly what I am thinking. I thank God every day that he came into our lives and I think his name fits his cute little face. He is good natured and they don't shed. Gotta lov'em!"